On a day of high tension in the House of Commons the Government has suffered a humiliating defeat when they conceded on a Labour Party motion laid before MPs during a Labour led Opposition Day debate. The debate centred on nurses pay as Labour pledged to abolish the pay cap for all NHS staff during the general election. However, as the debate proceeded it became obvious that the government would be defeated as rebel Tory and DUP (Democratic Unionist Party) MPs would side with Labour which would have handed the Government an embarrassing defeat, barely three-months into Theresa May’s weak Government; propped up by the DUP. 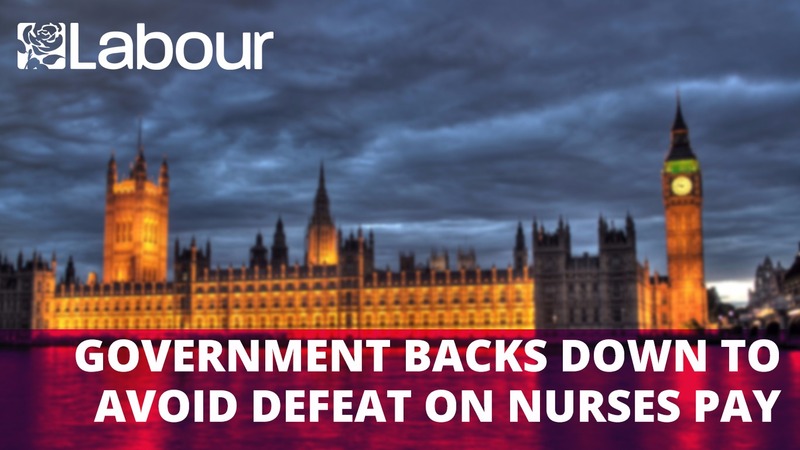 Labour called for the debate after mounting pressure on the Government in recent months which has seen an ever-growing workforce crisis in the NHS which is causing misery for patients and staff alike. The Government’s public sector pay cap has been a disaster for the NHS, and its nurses, doctors and other stuff. Currently, the NHS is 10,000 GPs, 3,500 midwives and now 40,000 nurses short of the number we need with nurses forced to use foodbanks to make ends meet. The Health Secretary says he has sympathy for underpaid health staff but sympathy won’t put food on the table. Labour would scrap the NHS pay cap and give hardworking NHS staff the pay that recognises the skill and dedication they bring to their working lives as well returning public sector pay agreements to collective bargaining and the evidence of independent pay review bodies. “This is an historic defeat for a paralysed and divided Government with Theresa May unable to get her MPs to vote to defend their own government’s policy. “Instead of debating the issues and facing Labour MPs they decided to run away with their tails between their legs and claim that these votes don’t matter.